Build mass and strength in the thighs, glutes, calves and lower back with Body-Solid’s SLS500 Leverage Squat. 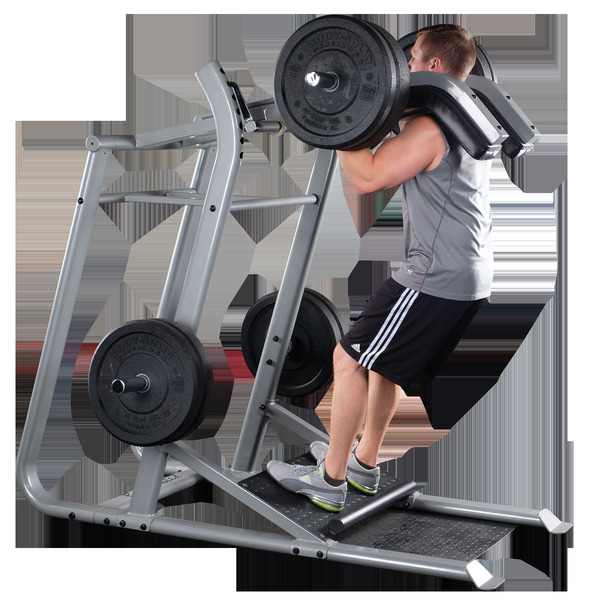 A biomechanically correct angled squat platform ensures peak effectiveness and safety through the exercises. A rounded calf block also provides extra range of motion making the SLS500 an ideal machine for those serious about squats. The 11" Olympic Plate storage horns allow for smart weight plate management and an oval 11-gauge steel frame ensures stability and sturdiness throughout the exercise. LIFETIME: Cables, Upholstery, Grips (Normal Wear)Body-Solid warrants that the Product you have purchased for non-commercial use from Body-Solid or from an authorized Body-Solid reseller is free from defects in materials or workmanship under normal use during the warranty period.Your sales receipt, showing the date of purchase of the Product, is your proof of the date of purchase.This warranty extends only to you, the original purchaser. It is not transferable to anyone who subsequently purchases the Product from you.It excludes expendable parts such as paint and finish.This Warranty becomes VALID ONLY if the Product is assembled / installed according to the instructions / directions included with the Product.IN-HOME WARRANTYThis Limited Express Warranty applies only in the United States to products manufactured or distributed by Body-Solid, Inc. ("Body-Solid") under the BODY-SOLID brand name (hereinafter referred to as “Product”).What Is Covered? During the warranty period, Body-Solid will, in its sole discretion, at no additional charge, provide the exclusive remedy of repair or replacement of the Product if it becomes materially defective, malfunctions, or otherwise fails to conform with this limited warranty under normal non-commercial, personal, family, or household use. In repairing the Product, Body-Solid may replace defective parts with new or, at Body-Solid's sole discretion, serviceable used parts that are equivalent to new parts in performance. All exchanged parts and Products replaced under this limited warranty will become the property of Body- Solid. Body-Solid reserves the right to change manufacturers of any part to cover any existing warranty. For Products sold for commercial use, the Products are sold "AS IS" without any warranty.How Long Coverage Lasts? Body-Solid warrants that the Product you have purchased for non-commercial, personal, family, or household use from Body-Solid or from an authorized BODY-SOLID dealer will be free from any material defects in materials or workmanship under normal use during the warranty period from the date of purchase. Your sales receipt, showing the date of purchase of the Product, shall constitute proof of the date of purchase.Important Additional Terms and Restrictions. This warranty extends only to the original purchaser. It is not transferable to anyone who subsequently purchases the Product. It excludes expendable parts such as paint and finish. It does not cover labor charges. While necessary maintenance or repairs of the Product can be performed by any company, we recommend that you use only Body-Solid or an authorized BODY-SOLID dealer for best results. Improper or incorrectly performed maintenance or repair voids this warranty. Body- Solid neither assumes nor authorizes any third party to assume for it any other warranty.This warranty is void under the following conditions: if the Product is not assembled/installed according to the instructions/directions included with the Product; if proof-of-purchase documentation or Product serial number is altered or forged; if the Product is used in a commercial, institutional or other public access environment; if the Product was not purchased from Body-Solid or from an authorized BODY-SOLID dealer. This warranty does not extend to any Product that has been damaged or rendered defective: (a) as a result of accident, misuse, or abuse; (b) by the use of parts not manufactured or sold by Body-Solid; (c) by modification of the Product; (d) as a result of improper or incorrectly performed service or repair by anyone other than Body-Solid or an authorized BODY-SOLID dealer or an authorized BODY-SOLID warranty service provider; (e) as a result of failure to provide reasonable and necessary care as outlined in the owner's manual for the Product. Should any Product submitted for warranty service or replacement be found to be ineligible, an estimate of repair cost will be furnished and the repair will be made if requested by you upon Body-Solid's receipt of payment or acceptable arrangement of payment.How to Redeem this Warranty. To redeem this warranty, you must contact Body-Solid at 1-800- 556-3113 or service@bodysolid.com. Body-Solid may elect to send a new part to remedy the defect. However in some cases, Body-Solid may need to directly repair or entirely replace the equipment in which case you will be given a Return Authorization Number by Body-Solid customer service. You then must return the Product, together with the Return Authorization Number and the sales receipt, in its original container (or equivalent) to the following address: Body-Solid, Inc., Attn: BODY-SOLID Warranty Dept., 1900 S. Des Plaines Ave., Forest Park, IL 60130. You must pre-pay any shipping charges, export taxes, customs duties and taxes, insurance, and any other charges associated with transportation of the Product. Body-Solid will not accept any Product returned on a freight collect basis or outside of Body-Solid's normal business hours. You are responsible for insuring any Product shipped or returned. You assume the risk of loss during shipment or return.How State Law Applies. This warranty gives you specific legal rights, and you may also have other rights which vary from state to state.THIS IS THE ONLY WARRANTY APPLICABLE TO BODY-SOLID BRANDED PRODUCTS. 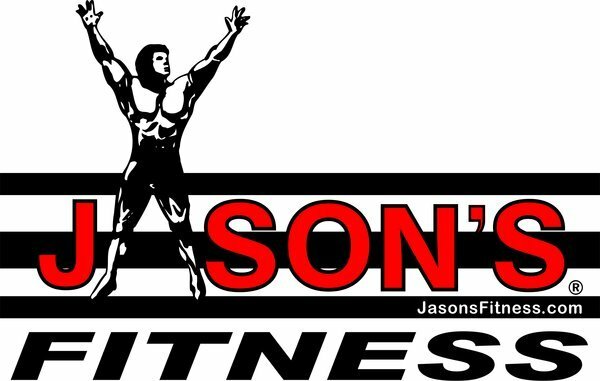 TO THE EXTENT PERMITTED BY LAW, BODY-SOLID DISCLAIMS ALL OTHER EXPRESS WARRANTIES AND ANY IMPLIED WARRANTIES OF MERCHANTABILITY AND FITNESS FOR A PARTICULAR PURPOSE BEYOND THE ONE (1) YEAR WARRANTY PERIOD.SOME STATES DO NOT ALLOW LIMITATIONS ON HOW LONG AN IMPLIED WARRANTY LASTS, SO THE ABOVE LIMITATION MAY NOT APPY TO YOU.NEITHER BODY-SOLID NOR ANY OF ITS AFFILIATES SHALL BE RESPONSIBLE FOR INCIDENTAL OR CONSEQUENTIAL DAMAGES, INCLUDING BUT NOT LIMITED TO LOST PROFITS, LOSS OF USE, OR ANY OTHER ECONOMIC DAMAGES ARISING IN TORT OR CONTRACT, INCLUDING ANY IMPLIED WARRANTY CLAIMS. BODY-SOLID'S AND ITS AFFILIATES' ENTIRE LIABILITY IN THE AGGREGATE SHALL NOT EXCEED THE PURCHASE PRICE OF THE PRODUCT.SOME STATES DO NOT ALLOW THE EXCLUSION OR LIMITATION OF INCIDENTAL OR CONSEQUENTIAL DAMAGES, SO THE ABOVE LIMITATION OR EXCLUSION MAY NOT APPLY TO YOU.Warranty is not applicable outside the United States - Before returning a product you must call BODY-SOLID at 1.800.833.1227 to obtain a Return Authorization Number. No returns will be accepted without the Return Authorization Number. Original purchaser must pre-pay all freight charges on warranty claims. BODY-SOLID will not accept Freight Collect shipments or return shipments on a freight collect basis. 1 YEAR: Cables, Upholstery, Grips (Normal Wear)Body-Solid warrants that the Product you have purchased for commercial use from Body-Solid or from an authorized Body-Solid reseller is free from defects in materials or workmanship under normal use during the warranty period.Your sales receipt, showing the date of purchase of the Product, is your proof of the date of purchase.This warranty extends only to you, the original purchaser. It is not transferable to anyone who subsequently purchases the Product from you.It excludes expendable parts such as paint and finish.This Warranty becomes VALID ONLY if the Product is assembled / installed according to the instructions / directions included with the Product.FULL COMMERCIAL WARRANTYThis Limited Express Warranty applies only in the United States to products manufactured or distributed by Body-Solid, Inc. ("Body-Solid") under the BODY-SOLID brand name (hereinafter referred to as “Product”).What Is Covered? 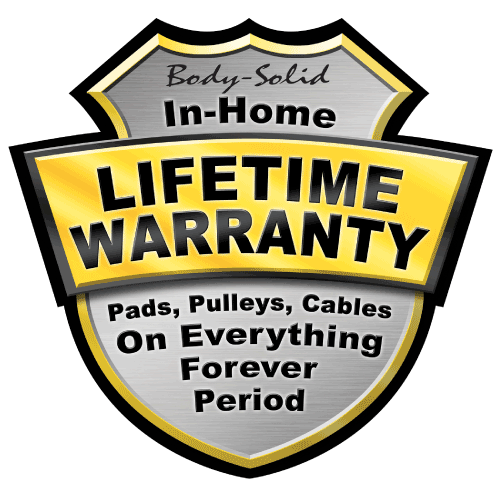 During the warranty period, Body-Solid will, at its sole discretion, at no additional charge, provide the exclusive remedy of repair or replacement of the Product if it becomes materially defective, malfunctions, or otherwise fails to conform with this limited warranty under normal commercial, personal, family, or household use. In repairing the Product, Body-Solid may replace defective parts with new or, at Body- Solid's sole discretion, serviceable used parts that are equivalent to new parts in performance. All exchanged parts and Products replaced under this limited warranty will become the property of Body-Solid. Body-Solid reserves the right to change manufacturers of any part to cover any existing warranty.How Long Coverage Lasts? Body-Solid warrants that the Product you have purchased for commercial or non-commercial, personal, family, or household use from Body-Solid or from an authorized BODY-SOLID dealer will be free from any material defects in materials or workmanship under normal use during the warranty period from the date of purchase. Your sales receipt, showing the date of purchase of the Product, shall constitute proof of the date of purchase.Important Additional Terms and Restrictions. This warranty extends only to the original purchaser. It is not transferable to anyone who subsequently purchases the Product. It excludes expendable parts such as paint and finish. It does not cover labor costs. While necessary maintenance or repairs of the Product can be performed by any company, or by the owner we recommend that you use only Body-Solid or an authorized BODY-SOLID dealer for best results. Improper or incorrectly performed maintenance or repair voids this warranty. Body-Solid neither assumes nor authorizes any third party to assume for it any other warranty.This warranty is void under the following conditions: if the Product is not assembled/installed according to the instructions/directions included with the Product; if proof-of-purchase documentation or Product serial number is altered or forged; if the Product was not purchased from Body-Solid or from an authorized BODYSOLID dealer. 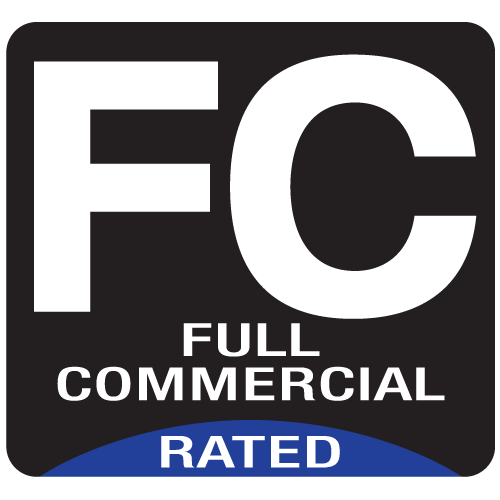 This warranty does not extend to any Product that has been damaged or rendered defective: (a) as a result of accident, misuse, or abuse; (b) by the use of parts not manufactured or sold by Body-Solid; (c) by modification of the Product; (d) as a result of improper or incorrectly performed service or repair by anyone other than Body-Solid or an authorized BODY-SOLID dealer or an authorized BODY-SOLID warranty service provider; (e) as a result of failure to provide reasonable and necessary care as outlined in the owner's manual for the Product. Should any Product submitted for warranty service or replacement be found to be ineligible, an estimate of repair cost will be furnished and the repair will be made if requested by you upon Body-Solid's receipt of payment or acceptable arrangement of payment.How to Redeem this Warranty. To redeem this warranty, you must contact Body-Solid at 1-800- 556-3113 or service@bodysolid.com. Body-Solid may elect to send a new part to remedy the defect. However in some cases, Body-Solid may need to directly repair or entirely replace the equipment in which case you will be given a Return Authorization Number by Body-Solid customer service. You then must return the Product, together with the Return Authorization Number and the sales receipt, in its original container (or equivalent) to the following address: Body-Solid, Inc., Attn: BODY-SOLID Warranty Dept., 1900 S. Des Plaines Ave., Forest Park, IL 60130. You must pre-pay any shipping charges, export taxes, customs duties and taxes, insurance, and any other charges associated with transportation of the Product. Body-Solid will not accept any Product returned on a freight collect basis or outside of Body-Solid's normal business hours. You are responsible for insuring any Product shipped or returned. You assume the risk of loss during shipment or return.How State Law Applies. This warranty gives you specific legal rights, and you may also have other rights which vary from state to state.THIS IS THE ONLY WARRANTY APPLICABLE TO BODY-SOLID BRANDED PRODUCTS. TO THE EXTENT PERMITTED BY LAW, BODY-SOLID DISCLAIMS ALL OTHER EXPRESS WARRANTIES AND ANY IMPLIED WARRANTIES OF MERCHANTABILITY AND FITNESS FOR A PARTICULAR PURPOSE BEYOND THE ONE (1) YEAR WARRANTY PERIOD.SOME STATES DO NOT ALLOW LIMITATIONS ON HOW LONG AN IMPLIED WARRANTY LASTS, SO THE ABOVE LIMITATION MAY NOT APPY TO YOU.NEITHER BODY-SOLID NOR ANY OF ITS AFFILIATES SHALL BE RESPONSIBLE FOR INCIDENTAL OR CONSEQUENTIAL DAMAGES, INCLUDING BUT NOT LIMITED TO LOST PROFITS, LOSS OF USE, OR ANY OTHER ECONOMIC DAMAGES ARISING IN TORT OR CONTRACT, INCLUDING ANY IMPLIED WARRANTY CLAIMS. BODY-SOLID'S AND ITS AFFILIATES' ENTIRE LIABILITY IN THE AGGREGATE SHALL NOT EXCEED THE PURCHASE PRICE OF THE PRODUCT.SOME STATES DO NOT ALLOW THE EXCLUSION OR LIMITATION OF INCIDENTAL OR CONSEQUENTIAL DAMAGES, SO THE ABOVE LIMITATION OR EXCLUSION MAY NOT APPLY TO YOU.Warranty is not applicable outside the United States - Before returning a product you must call BODY-SOLID at 1.800.833.1227 to obtain a Return Authorization Number. No returns will be accepted without the Return Authorization Number. Original purchaser must pre-pay all freight charges on warranty claims. BODY-SOLID will not accept Freight Collect shipments or return shipments on a freight collect basis.